Information on adding new breeds or updating existing information. 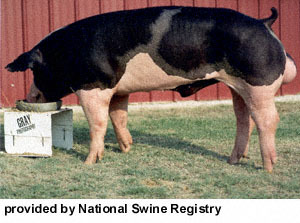 The National Spotted Swine Record Inc., was formerly the National Spotted Poland China Record. At the 1960 Annual Meeting, the breed's Board of Directors and members voted to change the name of the association from the National Spotted Poland China Record to the National Spotted Swine Record, Inc. Further, it was voted to refer to the breed as Spotted Swine, or SPOTS, rather than the longer previously used name for the breed. The present day Spots descend from the Spotted hogs which trace a part of their ancestry to the original Poland China, which consisted of six separate breeds and was referred to as the "Warren County Hog" of Ohio. One such breed imported into Ohio in the early ~1880's was a breed called the "Big China," mostly white in color, but having some black spots. They were good feeders, matured early, were very prolific and produced these characteristics in their offspring. Three men from Putnam and Hendricks counties, in Indiana, brought boars and sows back from Ohio from time to time to cross with their own good hogs; and thus developed a breed all their own from this background which kept the characteristic color of large black and white spots. They had no name, but it was the opinion of most men in the section that these spotted hogs were not only superior as the most profitable pork producer and all around farmer's hog to any other breed, but to another Poland as well. Farmers who had moved away without them sent back to get this rugged, easy feeding spotted hog. At this time two hogs imported from England, known as "Gloucester Old Spots," added a wonderful stimulant to the breed in the form of new bloodlines. There were a number of well known breeders in central Indiana who had been breeding these spotted hogs to the exclusion of all others for many years, and due to the general demand for them, the need had arisen for an organization to record and promote the big-boned, prolific Spotted hog as a separate and distinct family. Thus resulted the organization of a Record Association of Bainbridge, Indiana, which was incorporated under the laws of Indiana in January 1914, and has grown in the past seventy-odd years to one of the top ranking purebred breed associations in the United States. The National Spotted Swine Record, Inc. moved in December, 1985, to Lafayette, Indiana. The Spotted Association moved to 1803 W. Detweiller Drive, Peoria, Illinois, on May 1, 1992, which is the current location of the National Association. The present Spotted Executive Secretary is Dan Parrish. Spots have continued to improve in feed efficiency, rate of gain, and carcass quality, as can be proven in the testing stations throughout the country. Spots are popular with farmers and commercial swine producers for their ability to transmit their fast-gaining, feed efficient, meat qualities to their offspring. Testimonials from commercial men also point out that the Spotted female is under-rated as the Spotted influence in commercial sow herds adds productivity, gentleness, and durability. We are currently looking for high resolution pictures of any of the breeds. NOTE: The form can also be used for Comments, Suggestions, and Corrections. Copyright © 1995-2015 Oklahoma State University Board of Regents. All rights reserved.